This week is the letter E.
Running crazy. Life ebbs and flows, and the past 10 days have been on the super busy side for me as I've raced the clock, getting ready for this next event. Sniffing and sneezing. Having a cold this last week has been soooo much fun (sarcasm oozing there)! But all good things must come to an end, and so will this cold. Thank goodness. The sooner the better. LoL. In the midst of all this, one verse repeats in my mind, making me smile every time. As a teen in Ecuador, there were earthquakes one year. I was living with my basketball coach, Donna Voth. I learned a lot from her. Donna seemed to enjoy the earthquakes. I remember her grinning and quoting a verse while dove for a doorway. The verse? And that verse has made me smile for the last week as I've slogged through these things I've had enough of. So tell me, what have you had enough of lately? What have you been expending effort on? 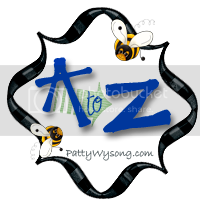 If you're joining us for the A to Z meme by posting on your blog this week about the letter E, be sure to add your name and the link to that particular post in the linky gadget here. Also, if you don't have the linky gadget on your site, click the link to get the code so you can add it. Yes, I bet you have!! So glad you're getting to go up to Karla's Shelley!! I'm praying for you! Have fun!! Enough? I've had enough of the PC enviroment we live in. I've had enough rain!!! We've had so much rain here in South Carolina that I expect to see the ark floating down my street. More rain than I've seen in my 60+ years living in this state. Everybody has mushrooms in their yards. Rain is a wonderful thing, but not month after month after month. You have a monkey? How cool is that? Wow. Sorry you're sick, Patty. Hope you feel better soon. And what is this next event??? 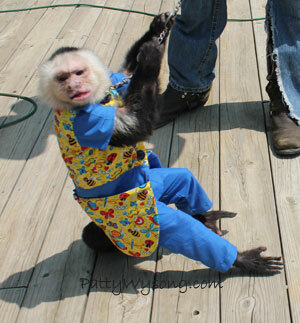 You sew monkey clothes! Hahaha! Not something you read about every day and it took me off guard. Enough ... let's see. I've had enough of this pregnancy waddle! Oh, could you show and tell more of what you do with Fonzie? I remember an organ grinder and monkey at Knott's Berry Farm way back when. So cute! Enough? I've had enough of work: I'm ready to retire and four years can't fly fast enough. I've had enough of being EXHAUSTED! This was a fun post. Your monkeys fascinate me. Do You Have the Right Vowel?